One week to go until Leeds Wool Festival at Armley Mills Industrial Museum next Saturday 4 June. 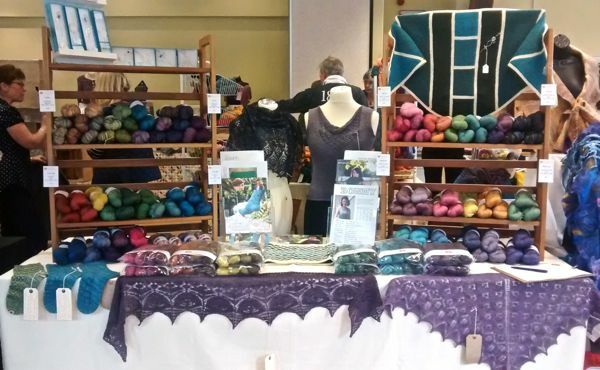 We had a great time at Wharfe Wool Fair a few weeks ago, here’s what the stall looked like before the hoards descended! Now preparations turn to Leeds. Leeds Wool Festival takes places in the wonderful Armley Mills Industrial Museum. The mill was very badly hit by the Boxing Day floods and has only recently been able to open to the public again. There is still a lot of restoration work to do, mainly to the steam and traction engines, but they are keen to encourage people back and to support their work. A great day out I’m sure you’ll agree! There’s full information on how to get there etc on the Leeds Wool Festival webpage. What will I have there with me? 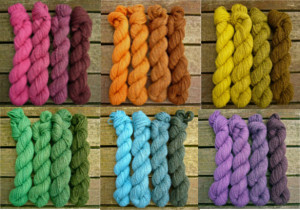 The usual selection on British wool, all hand dyed by me with natural dyes. I’ll have sock, 4ply and lace yarns (though if there’s any DK or Aran you particular wanted to see from the Etsy shop do let me know and I’ll try and pack it in somewhere!). I’ll also be launching three patterns to support my Shetland Gradient packs. I’ve been working again with local designer Gwen Wagner-Adair of Petitchoufleur Knits to create three patterns to make the best use of the packs. If you were at Wharfe Wool Fair you’ll have seen two of the three samples, printers and postal service permitting we’ll have the printed patterns for all three items on the 4 June. 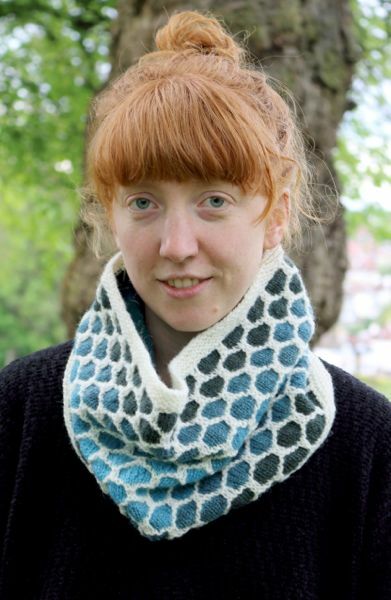 First up we have Seafoam Gradient Cowl. Designed by Gwen this cushy slipped stitch pattern makes the most of one full gradient pack, but is a nice easy knit, only using one colour per row at a time. The sample here is shown in the Baltic colourway. Next up is Baltic Gradient Shawl and Mitts, designed by me. The cosy garter stitch shawl is another nice easy knit, with interest provided by the decreases and changing colour sections. Perfect TV or travel knitting! 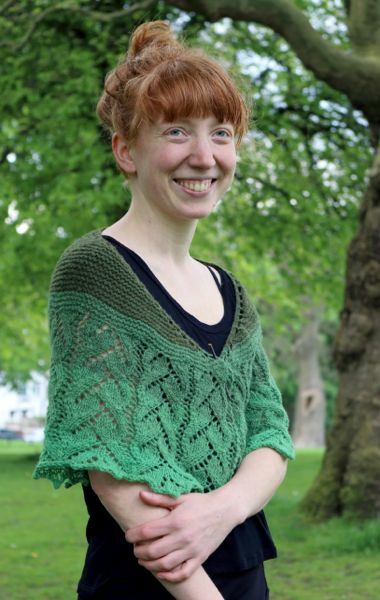 And finally, there’s Twinings Gradient Shawl, again designed by Gwen. 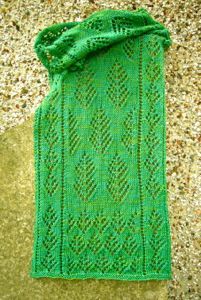 A lacy pattern of living leaves grows from a simple garter stitch crescent, made without any short rows! Printers and postal service permitting(!) 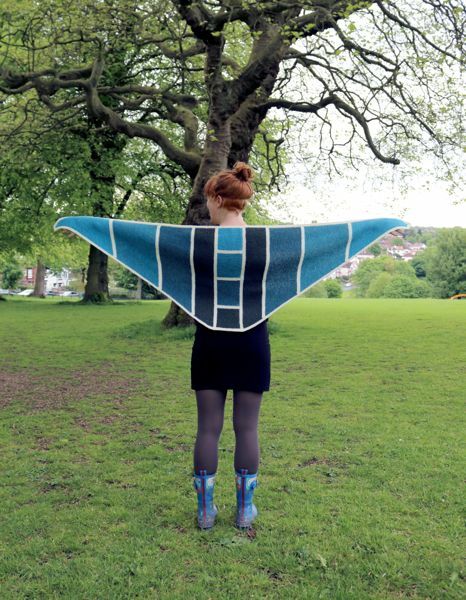 we’ll have the printed patterns for all three items at Leeds Wool Festival on 4 June. The patterns will then be available as pdf downloads from 5 June on Ravelry. This entry was posted in Dyeing, Knitting and tagged British Wool, dyeing, Gradient, Hand dyed yarn, Leeds Wool Festival, patterns, Wharfe Wool Fair on Saturday 28th May 2016 by sylvantiger.